Check out our company car, the Sticker Mobile - a fun, eye catching promotional vehicle powered by the wholesale custom stickers of hundreds of organizations that have worked with Websticker. 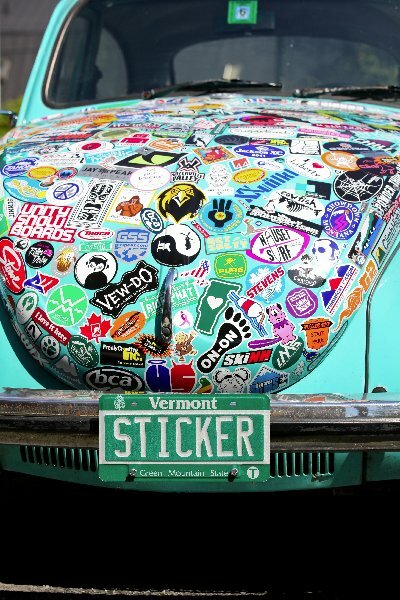 The Sticker Mobile is a work of art - a collage of custom car stickers that are the pulse of America with thousands of vinyl snippets of art, thoughts, logos and slogans. The idea for the StickerMobile was hatched over 15 years ago. Jeff Nicholson envisioned covering a car completely with various promotional car stickers, not a car wrap, but thousands of bits of Americana in the ultimate custom car sticker collage. Jeff made some efforts to convince a car company to donate a car for the project in exchange for massive promotion as the car drove around the country with a touring musician at the wheel. There were no takers. 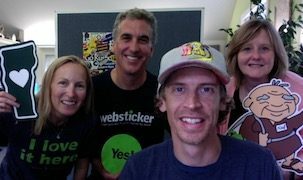 The idea would not die and the StickerMobile.com URL was held in reserve. 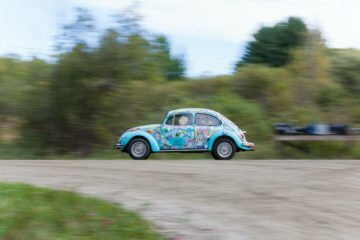 Fast forward to 2011 when Brooke, a then employee of Websticker, saw a 1972 VW Beetle on the side of the road in Montpelier, Vermont. It was reasonably priced and like most old Beetles had that certain something that said, “yea, I wouldn’t mind being totally covered with stickers... sounds fun”. So, Websticker made the purchase and now had their first company car. The previous owner, Melissa, had brought the car from California and enjoyed many years with her little bug. But, deep down Melissa knew that this Bug was destined for bigger things. It needed more love, repairs and a new outrageous, eye catching wardrobe. Once the Car arrived at its new home in front of the Websticker office in Stowe, stickering immediately commenced on the hood of the car. That was followed by covering the back of the car and its bumper in more promotional car stickers. 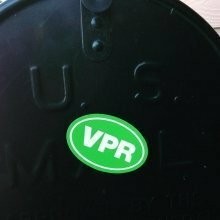 Around the same time the vanity plate, STICKER, was secured from the Vermont DMV and the cars fate was sealed. The first winter was spent in an old industrial hen house with a bunch of other interesting cars. It spends all winters there now as it doesn’t really appreciate the cold and snow and traction needed for Vermont winters. When the car came out of hibernation in the spring after it's first winter it was quite obvious some attention was needed on the breaking and steering systems. As it turned out extensive work was needed just to pass inspection and keep it on the road. 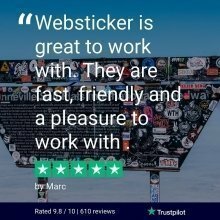 So, Websticker invested about an equal amount into the car that they had originally spent buying it – and the Sticker Mobile has been promoting custom car stickers ever since. We have since covered the roof and side doors with promotional car stickers. In 2016 we kicked into finishing off the cars fenders while continuing to replace old or damaged custom car stickers. 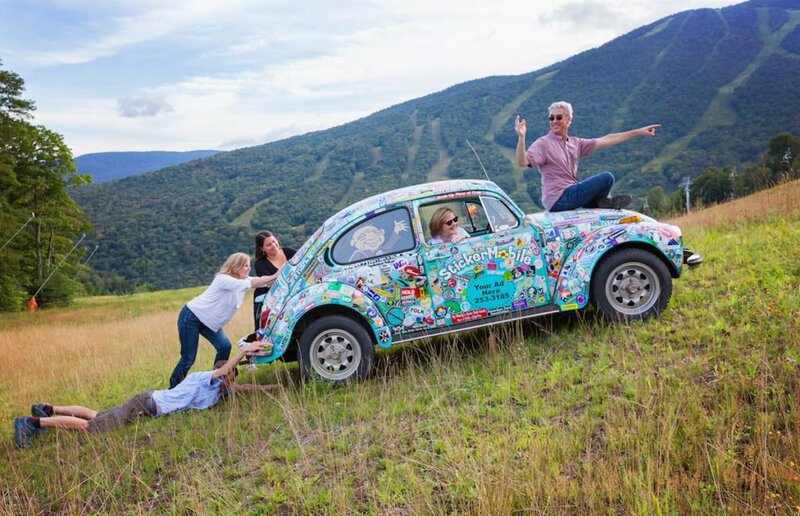 But, this story is not over, the car will continue to roll, spreading custom car stickers and smiles wherever it travels (which unfortunately, isn't very far from it's home in Stowe Vermont). 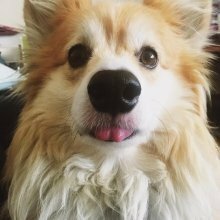 This is a work in progress – one we hope you can be a part of whether it be adding promotional car stickers to the sticker mobile, showing your friends, or buying a sticker pack and starting to cover your own objects. 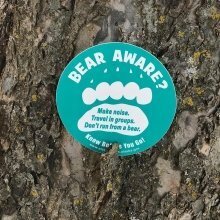 Spread a kind word, spread a smile, and do what you can to 'add fun to the fun' in your own unique way – our way just happens to involve lots of stickers. 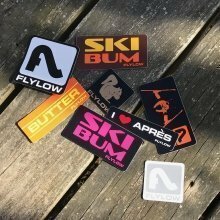 Contact us about producing stronger promotional car stickers for your organization - custom car stickers worthy of being showcased on the Sticker Mobile. Our Sticker Car is also available for parades and events to hand out stickers, for not only exposure and promotion, but to add fun to the fun.